Receive the same information, at the same time, in your own language. Simultaneous interpretation is the process of repeating what someone says in another language at the moment that person is speaking. Particularly useful for conferences and large and small gatherings when time is crucial or when the message must be conveyed into multiple languages. 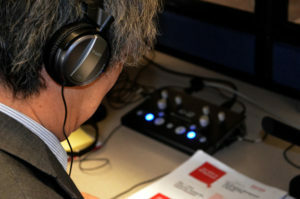 Simultaneous interpretation is available for all of our 135 provided languages. Whether you are an international company with staff in different countries, are providing training for foreign clients, or are looking to market yourself to non-English speakers, Translation Excellence can provide simultaneous interpreters for as many languages as you desire. Make your next conference or company meeting a success. Reach out, go further, and do more. Do you need conference (simultaneous) interpretation services? Please click here to request a free quote or give us a call at 720-325-0459 or 877-409-6737 if you have any questions. We will be happy to schedule some of our most qualified interpreters for your next event.